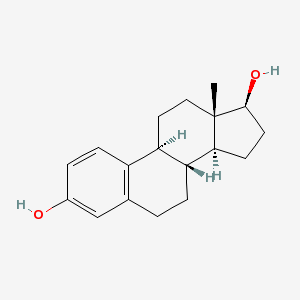 Generally refers to the 17-beta-isomer of estradiol, an aromatized C18 steroid with hydroxyl group at 3-beta- and 17-beta-position. Estradiol-17-beta is the most potent form of mammalian estrogenic steroids. In humans, it is produced primarily by the cyclic ovaries and the PLACENTA. It is also produced by the adipose tissue of men and postmenopausal women. The 17-alpha-isomer of estradiol binds weakly to estrogen receptors (RECEPTORS, ESTROGEN) and exhibits little estrogenic activity in estrogen-responsive tissues. Various isomers can be synthesized.